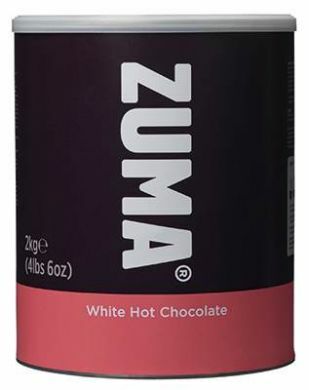 Zuma white hot chocolate is a drink for the real connoisseur, it has a high cocoa content and a delicious intense cocoa flavour; more of a European style. Zuma White Hot chocolate is good as cold chocolate too, mix it up with ice on hot days. Or you could add syrups to create some interesting flavour variants. How about a shot of Toasted Marshmallow, Vanilla or Hazelnut, to suggest a few. Have a go, be creative and see what you can come up with. This is a 2 kg tin of incredibly versatile White Chocolate powder, you can even use it make a rich, thick chocolate sauce! 2kg delicious white hot chocolate. Put 1 scoop (28g) Zuma hot chocolate powder into a 12oz cup. Add a splash of hot water and mix into a smooth paste. Add steamed milk, stirring as you pour. Serve with whipped cream, marshmallows and a dusting of cocoa. Sugar, Sweet whey powder (milk), Skimmed milk powder, Cocoa butter, Glucose syrup, Thickener: carboxy methyl cellulose, Natural flavouring, Anti-caking agents: calcium phosphate, silicon dioxide, Milk protein, Salt, Stabiliser: sodium triphosphate. 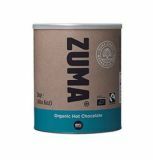 To make Zuma White Hot Chocolate 12oz serving: Mix 1 scoop Zuma - White Hot Chocolate with 12oz (355ml)of steam milk.